Hoping to get the reconstruction plan the Ashram has submitted to the government authorised, Amma held a meeting with Sri. Oommen Chandy, the Chief Minister of Kerala, today at Amritapuri. Amma conveyed to the chief minister the necessity of moving forward quickly with the reconstruction, explaining to him how traumatised the villagers are. “They are still not sleeping well at night. If there is even a small power surge and the ceiling fan picks up speed, they awake with a start, thinking it is another wave,” Amma said. Amma also went into the details of the Ashram’s plan, which includes a seven-foot foundation—two above ground and five below. She expressed Her deep concern for the feelings of the people, and her wish to see their homes rebuilt right away. “At present we have constructed nine temporary shelters, and 250 families are being accommodated there. In Alappad Panchayat, there are a total of 9,902 displaced. 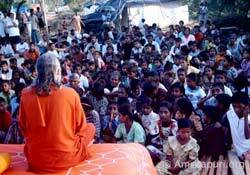 Of them, 6,000 are in Ashram-run relief camps. The government has not yet finished the temporary shelters it has undertaken to build. If the government had responded to the Ashram’s overture earlier, we would have 100 homes built by this time. “In Tamil Nadu, the government is fully cooperating, and we already started the construction of 2,500 houses there, and we have adopted 350 children who lost their parents in the tsunami. We have also fully adopted two villages in Nagapattinam. In Andaman and Nicobar Islands, we have adopted three villages, as well. On Tuesday, Amma will be flying to Sri Lanka in order to uplift and console the tsunami victims there. The Ashram presented a new house plan to the Kerala Government. The plan consists of two bed rooms, a kitchen, dining hall and a toilet on the ground floor and a bed room on the first floor. The building will be built on concrete piling with belt foundation. Turiyamritananda inaugurated the shelter built by the Ashram on the grounds of the Purakkad Devi Temple in Azhikkal. Although the temple is ready for inhabitation, the government has yet to allow anyone to move in. The total number of temporary shelters built by the ashram in Alappad is now nine. On 29 January, the Ashram started a stitching programme at its temporary shelter in Srayikkad. Using sewing machines provided by the Ashram, in the beginning some 75 ladies will learn to stitch clothes. The programme was inaugurated by Swami Krishnamrita Prana. The ladies will have two-hour-long classes for the next three months. Amma intends to start more vocational training courses so that the villagers can earn their livelihood. The Ashram is sponsoring the paramedical-training of tsunami-affected young men and women at AIMS. They will be provided with free accommodation, food, clothing and a Rs. 500 weekly stipend through the duration of the training. Upon the successful completion of their training, they will be offered employment at the hospital, with a starting wage of Rs. 2,000. The Ashram plans to sponsor 300 tsunami-affected villagers in this fashion. Ashram is also sponsoring the training of young men as drivers at its ITC (Industrial Training Centre) in Putiyakkavu. They also will be provided with free accommodation, food, and Rs. 500 stipend during their training. 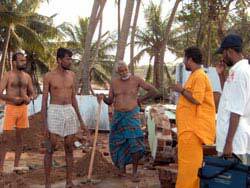 Upon completion of their course, the Ashram will find jobs for them. The Ashram is planning to start an orphanage in the Nagapattinam District of Tamil Nadu for some 300 children who lost their parents in the tsunami. The Ashram has sent two boys Kannan and Aravind from Alappad who will go to the Ashram’s orphanage in Parippally. They will be joining the 7th standard in the school there. Ashram has also adopted three retarded children from the village. The Ashram has recently sent three more women in their final stages of pregnancy to AIMS for antar-natal checkups and deliveries. The Ashram is sponsoring the reversal of the tubal-ligation surgery for seven women who lost all of their children to the tsunami, so that they may once again know the joy of motherhood. On 25 January, Swami Amritaswarupananda distributed cash allotments of Rs. 750 to 1,565 villagers in Arattupuzha in Kerala’s Alappuzha District. The money is to be used for the purchasing of household items. The Ashram continues to provide food three times a day at 22 counters up and down Beach Road in Alappad Panchayat. It has also started serving at certain schools in Alappad, so that the children can have hot lunches. Amma took the photograph, looked deeply into the eyes of the four-year-old boy it pictured and gently kissed his forehead. She then took the next photo—this one of a girl in pig tails—and did the same. There were around 70 in all, so it took some time. These were photographs of the children who’d burned to death in Kumbhakonam. It made international news when it happened back in July: 92 children killed and more than 18 severely burned when the thatched roof of a nursery school caught fire in a small Tamil Nadu village. Now, six months later, Amma’s room was packed with the mothers and siblings of these children—140 parents had come in all. 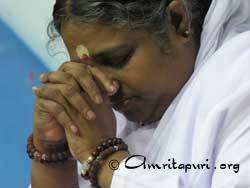 Earlier that day during darshan, one of the mothers had become inconsolable in Amma’s arms. Amma held her for some 10 minutes, allowing the woman to exhaust herself in Her arms. The whole time Amma was wiping away both the woman’s tears and Her own. When the tragedy occurred, Amma was in the middle of Her U.S. Tour. When She heard the news, She called Amritapuri and told a group of brahmacharinis to immediately go to Kumbhakonam to pray for the children and to console the parents. The girls left that day and soon were visiting all the parents, as well as the survivors in the hospital. The stories they heard were heart-rending. “My son, he came running out of the classroom, but then he remembered that his younger sister was still inside, so he ran back in to get her. But they both died,” one mother told them. A father told the brahmacharinis how before the fire his children had not gone to school for two days. They had wanted to stay home that day as well, but he had forced them to go. “I forced them to go, and because of me, I lost both of them,” he said. One mother told the girls that she had only been able to recognize her daughter’s body by the anklets she had put on her that morning. The brahmacharinis chanted Amma’s 108 names and the eighth chapter of the Gita as part of the children’s funeral rites. They then brought some of the ashes back to Amritapuri, which Amma blessed and offered into the sea upon Her return from the U.S. Tour. Today, in Amma’s room, one of the fathers reminded Amma of the brahmacharini’s visit. “Your children came and gave us peace,” he told Amma. “I am willing to go to school but my mother is not willing to send me,” one little girl who’d lost her brother in the fire told Amma. “I don’t want to lose her too!” the mother called out. Amma told the woman not to worry, that she should send her daughter back to school as it was important for her to get an education. Amma spoke with the mothers and children for almost one hour, listening to their stories, looking at pictures of their children and wiping the tears of one and all. Among the people coming for Amma’s darshan in Amritapuri have been a number from Sri Lanka, the tiny island country a stone’s throw from India’s southern tip where more than 30,000 people were killed by the tsunami. They’ve been begging Amma to come to them, to bless the half a million people who have been displaced there. Amma promised to go in the near future [16 February] and for the time being sent Swami Ramakrishnananda, telling him to console the distraught as well as to assess the potential for the Ashram to do relief work there. Accompanied by four brahmacharis, Swami Ramakrishnananda left for the island country on 21 January. The team visited villages in some of the worst hit districts in Sri Lanka: Batticaloa and Ampara on the eastern coast, and Galle in the south. In Batticaloa, they first visited Tiruchendur. This is the area where the water came as high as the coconut trees and left virtually nothing standing. Some Singhalese volunteers who were helping with relief work in the area showed them an electrical tower, by climbing which 60 villagers had been able to survive the flooding. Amma’s disciples next went to Akkaraipattu in the Ampara District. There, they met with Minister K.N. Devananda’s offices, as well as Rama, a Malaysian HSS (Hindu Seva Sangh) coordinator, conducting relief work. Swami Ramakrishnananda told the coordinator that it was Amma’s desire to help both the Tamils and the Singhalese people of Sri Lanka. While in Ampara, the team visited the Kannagi Ammam Temple in the Tirukovil. In this area around 700 people died and 23,000 families were affected. There, they met a group of HSS volunteers who were between the ages of 10 and 20. 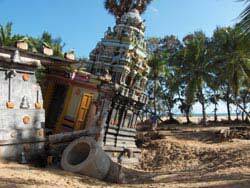 Many of them had been directly affected by the tsunami. The HSS volunteers would go to the relief camps as early as 7:00 in the morning and talk with the villagers, listening to their sad stories. They would also distribute free clothes and food as well as sing bhajans with the children. Many days they would not take lunch until 5:00 in the evening, continuing to work until eight or nine at night. The next day Swami Ramakrishnananda conducted a programme at Komari 2, including satsang, bhajan and meditation. At the request of local volunteers Swami installed a murti of Lord Ganesha on the top of a nearby hill. The team then drove back south to Colombo, where they met with Sri. K.N. Devananda, the minister who’d invited Amma to Sri Lanka. They also took the opportunity to visit a Singhalese relief camps in the district of Galle. Now, Amma has announced (news) she is going Sri Lanka on 16 February. The prayers of her Singhalese and Tamil children there are clearly pulling Her to the island’s shores. Today marks one month. One month since the tsunami came. One month since everything changed for millions in South East Asia. 250,000—this is the death toll. But what about the number of people sent into mourning? What about the number of people rendered homeless? What about the number who lost their source of income? Their ability to sleep through the night? For them—the survivors—one month ago everything changed. And for one month now they’ve been waiting for it to change back. Each day many come to Amma, and their eyes say it all. Death does not negotiate; it forces you to accept. And this is what is happening—slowly, with each passing week, the villagers are coming more and more to terms with the empty spaces left in their lives. Now, it’s the other things—the things that are actually possible to fight—about which they are coming to Amma. Amma says that when she hears such things, it pains her. Since the tsunami, the Ashram has built temporary shelters for some 250 families in the Alappad Panchayat alone—and for another 300 families in Nagapattinam, Tamil Nadu. It has also lent five acres of land to the Kerala government for it to build temporary shelters on as well, and is accommodating 2,000 villagers at the Amrita University engineering college—despite the fact that Christmas vacation has long since ended. Amma says she was happy that the Ashram was able to get the shelters up so quickly, but that now she is saddened to hear the sorrows of the villagers. She is impatient to get the construction of the new houses started. The villagers’ hardships are seemingly unending. With their fishing nets and boats lost or damaged beyond repair, the fishermen have no way to work. And even the ones who have the means to fish are not going out to sea. They say the fish are not where they are supposed to be, that the sea has strange undercurrents now, and even when they make a size able catch they are not able to sell it at a decent price. Some women are in the final stage of pregnancy but have no proper place to rest. The sick have no chairs to sit on, no cots to lie down upon at the camps. At the shelters, many of the men have begun sleeping in the open air, out of consideration for the women. “They are trying to be strong,” Amma says, “but many are suffering from depression.” They have no work, and they don’t see any light at the end of the tunnel. The Ashram has not stopped serving food since the day the tsunami struck—first at the 12 relief camps, then at the temporary shelters and at 22 food counters up and down the Beach Road. There is no way to calculate how many people will come to take food on any given day. Seemingly at random, one day it’s more, one day it’s less. 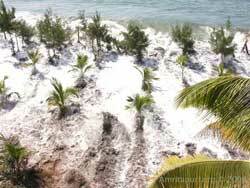 According to the brahmachari in charge, one of the problems is the phenomenon of what have come to be known as “tsunami tourists,” people who take drives down Beach Road to view the damage and then—having no other place to get food—eat at the Ashram counters. The brahmacharis preparing and transporting the food are under a lot of pressure. Amma has told them to make sure that not one serving spoon of food is wasted. So they have to be very careful not to make too much. At the same time, if they make too little and run out, the villagers may have to wait for them to cook more—this is also unacceptable. The solution is a delicate dance: they prepare a set amount of rice and then keep the water to cook more on the cusp of a boil. The brahmachari in charge of transporting the food out to the Beach Road counters carries a mobile phone, and as soon as he is sure they need more rice, he puts in the call to the kitchen. The same thing is done with the curry. After the first batch is made, a base is prepared to which the final ingredients are added only if they get the call. If more is not needed, that base can be used for the next meal’s curry. There are other pressures too. Amma has repeatedly told the brahmacharis doing this work that they must make sure that no strangers come into the kitchen, behind the serving counters or into the vehicles transporting the food. She is worried that some malicious person may try to contaminate the food. She has also told the brahmacharis that they should not eat until all of the villagers have been served. The other day, the brahmachari in charge of the kitchen was conveying some of these problems to Amma during darshan. Amma agreed with him that the situation was difficult. “It’s only by grace that we’ve been able to do what we are doing,” she told him. Indeed, serving all these people—every day, three times a day, for one month now—would be impossible by human effort alone. The Ashram doctors have also been sending women in the final stages of pregnancy to AIMS for antar-natal checkups and deliveries. They’ve even arranged for seven women who lost all their children in the tsunami to go to AIMS to see if doctors there can reverse their contraceptive tubal-ligation surgeries. It is the hope of the couples and of Amma that they once again will be able to know the joys of parenthood. And it’s not only the villagers of Alappad who’ve been coming to Amritapuri seeking Amma’s help. On three different occasions, people from various villages in Nagapattinam, the hardest-hit district in Tamil Nadu, have also made the pilgrimage to the Ashram. Some of those villagers said they were told specifically by M.J. Radhakrishanan, the District Collector of Nagapattinam, to go to Amma and ask for her help. In their district, many big companies have started constructing houses, but the villagers are insisting that Amma also should build some. She has agreed—adopting two villages and promising to build 2,000 homes in three villages altogether. Amma has said that She would love to build 3,000 houses in the island country—stressing that all are Her children, not just the people of India. But it is difficult to arrange the work, as according to Indian law the Ashram cannot expend funds in another country. For the time being, She has sent Swami Ramakrishnananda, Brahmachari Vinayamrita Chaitanya and a few other brahmacharis to look into the potential for Ashram assistance in the country. As for Amma, one has never seen Her more busy. Even as she gives darshan, she is constantly dealing with various aspects of the relief work. And when darshan is finished, She continues all night long in her room—meeting with people in person and on the phone—government officials, village leaders, brahmacharis in charge of construction… Anyone who walks by can see that her light is on all night. She takes no rest at all. In his letter, he requested Amma to come for four days, specifically to visit the areas of Batticaloa, Ampara, Trincomalee, Jaffna, Hambantota, Galle and Matara. “We are deeply touched by the great spiritual and humanitarian work undertaken by Your Holiness and by your Ashram to the poor and needy people in many parts of the world,” he wrote. In response, Amma has already sent Swami Ramakrishnananda, Brahmachari Vinayamrita Chaitanya and three other brahmacharis from the Ashram. Some 15 villagers from the Nagapattinam District of Tamil Nadu came to Amritapuri. The fishermen asked Amma to help them overcome their fear of water and begged her to come to Nagapattinam. Amma has donated five boat engines to Nagapattinam villagers who have lost theirs to the tsunami flood. The engines service five-man fishing boats. Thus 25 people will soon be able to restart their fishing trade. The Ashram is also looking into replacing small fishing boats lost by local villagers as well as fishing nets. The Ashram has agreed to finance the education of tsunami victims from Azhikkal [Alappad Panchayat, Kollam District, Kerala]. The girls will pursue their bachelor’s of education degrees at BEd College (for Teacher’s) in Mysore. The good news is, according to some estimations, we’ve already completed 5,107 years of Kali Yuga. The bad news is we have 426,893 more to go. In the 12th chapter of the Srimad Bhagavatam*, Suka Maharishi gives King Parikshit a detailed account of what life will be like in the age “when only a quarter of the four feet of dharma remain.” What he describes is disturbing: a world steeped in darkness, where greed, lust, thievery, poor physical and mental health and spiritual ignorance reign supreme. When one reads this, it’s hard to not think of the tsunami. Recently when asked about the cause of the tsunami, Amma pointed to man’s exploitation of nature, the cause of which is two-fold—adharmic actions stemming from lack of faith in God and the world’s population problem. 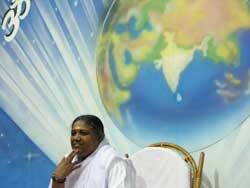 Amma said that the world’s birth-rate is continually increasing and its death-rate decreasing. She has specifically mentioned India and Bangladesh as being places where this problem is particularly out of hand. “If things continue the way they are, in 30 years India will have the No.1 population problem,” Amma said. Amma admitted that limiting the number of children they have could be difficult for some couples because of the strength of their vasanas [tendencies]. “But it can be done,” She said, citing for example the sacrifice some Indian families make when the husband temporarily relocates to a Gulf country in order to make more money. “For everything, we need control,” Amma said. The implication was clear: we are willing to sacrifice for the sake of our immediate family; we need to become more expansive and become willing to make such sacrifices for the sake of this one-world family. Reading the Bhagavatam, one realizes the horror of Kali Yuga is not a thing of the future. True, things can get even worse, but we are already very much in the Age of Kali. Almost all of Sage Suka’s predictions have already come true. *Srimad Bhagavatam is a text written at least 5,000 years ago by Sage Veda Vyasa. It details the incarnations of Lord Vishnu and details many aspects of the modern world. Ashram continued its distribution of Rs. 1,000 to families of Alappad today, serving the remaining six wards of the panchayat. At the request of tsunami volunters from Sri Lanka, Amma has sent Swami Ramakrishnananda to the island country. Ashram has completed a total of eight temporary-shelter halls in Srayikkad, housing some 200 families. From of some of the government relief camps, 2,000 more evacuees have come to Amma’s camp at Amrita University.